The college has limited visitor parking and encourages visitors to use public transport wherever possible. The college is a five minute walk from Winchester Railway Station. Leave Winchester Station, turning left into the underpass and exiting onto Stockbridge Road. Cross Stockbridge Road and proceed up Cranworth Road. At the top of Cranworth Road turn right into Hatherley Road, then left into Owens Road. The College is on your left and Reception is in Northbrook, which is the first building on your right. 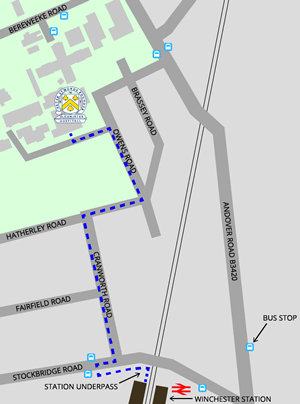 There are bus stops in both Bereweeke Road and Andover Road (these are shown by the logo on the Google map below). The following websites contain useful information about public transport services in and around Winchester.